This Cala Lily is from my garden. As this season arrives each year a sweet sorrow takes over my mood and every season I ask, "What is this emotion?" and I remember, "Oh! It's me missing Taddie, again." Taddie was Tall Husband's mother, a wonderfully eccentric, second generation Brit, who was the personification of excess: too much red lipstick; too many bangles and rings; too many martinis; and throw in the fact that no one had to wonder what was on her mind. Besides loving all those things about her, I loved her odd sayings and the way she told a story. Taddie was wary of me at first, for as she said, sending a child out into the world is the most painful part of being a mother. She learned to trust that I would always care for her son and we grew to be great friends. We talked every day on the telephone. At least once a month, I thanked her for entrusting me with her son. In return she was my "Dear Abby," who gave sound advice on matters of finance, love and life. Over dinners at her home, she told wonderful family stories, often illustrated with family photos from her stash of old black and white photographs. "Here he is when he was just a boy in his cowboy boots; you know, he used to piss in his boots." "And here he is before his plastic surgery...yes, he had those Prince Charles ears." "Here she is, back when she had her looks, with the help of a nip and tuck and gallons bleach to keep her blond. If you ask me though, her legs were too far apart and her eyes too close together." There were old photos of Taddie in that box also. She had been a great beauty. Early one spring, after Taddie's funeral, I sat alone in the garden crying. 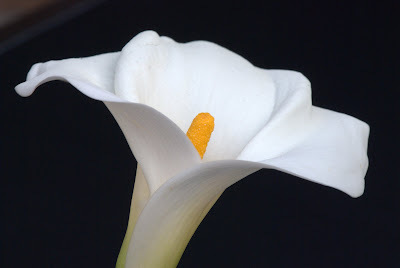 When I wiped my tears and looked up I saw one white lily standing tall among the foliage. They had been planted years earlier and this was their first bloom. Taddie often said, "I hate white flowers. Why be a flower if you cannot have color?" "Taddie, you remembered that I love them white," I whispered. So this time of year I go to my garden and there is always a single white lily waiting for me. "Thank you...and again, thank you for giving me Tall Husband." The garden and I fall silent, then I can just hear Taddie say, "It's damn so quiet around here, you could hear a cat piss in Egypt." I smile and go about my life. ~I slipped over here from "A Heart in Provence"
Thank you so much. And for stopping by! I love Taddie's comment about why being a flower if you can't have color. It's wonderful that memories of her are brought back by such beauty. Thank you for reading about Taddie. She would have loved your wonderful flowers. It's a blessing to remember those great people who affected us so deeply in life. Thank you for sharing this lovely tribute. Taddie would have been pleased! Thank you for sharing such a sweet memory of your mother in law. I think the British have the best sayings!! My grandmother had them and my mother in law does too. She sounds like she was quite a character, I love people like that! Thank you for reading about Taddie. You are right, she was quite a character. I'm so pleased to hear that you have characters in your family, also.